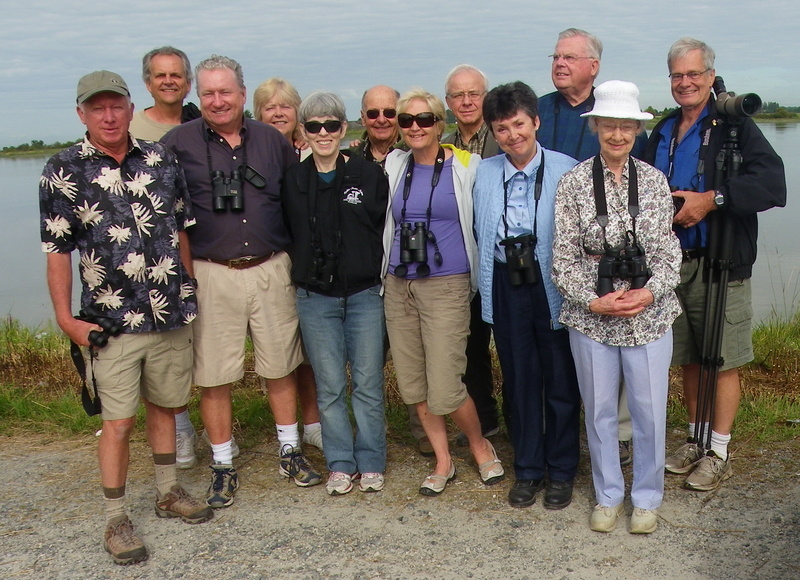 The Dirty Dozen (Rick & Mark, Ken & Anne, Roger & Mike, Alan & Lorna, Anne & Hans-Ulf, Eleanor and me) spent a gorgeous and productive Wednesday morning of birding along the causeway to the Tsawwassen Ferry Port and then at Reifel Bird Sanctuary. Hi-lites were: Black Oystercatchers, Caspian Terns, our destination bird the Willet, Sandhill Cranes and lots of newly-arrived Shorebirds including Dowitchers, Spotted Sandpiper and many Peeps (Western, Semipalmated and Least Sandpipers), and of course the fresh Strawberry and Blueberry Sundae at Emma-Lea’s Farm. 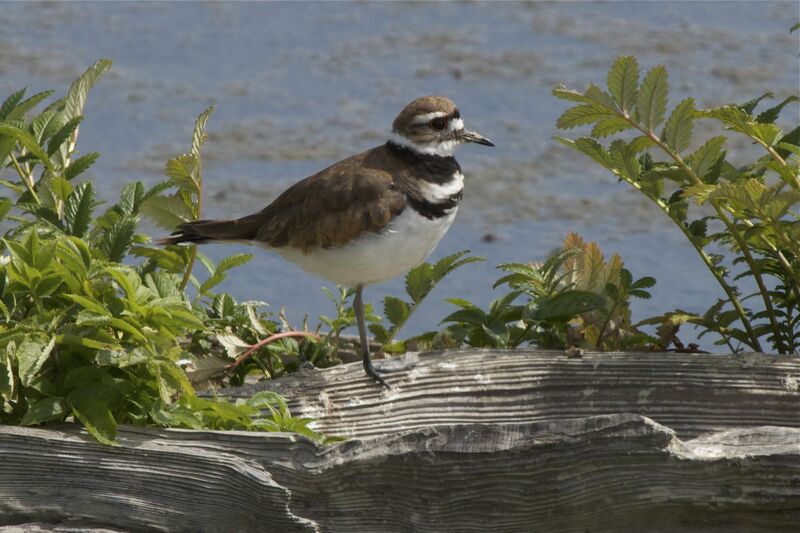 Check out Rick’s, Ken’s and Roger’s photos, soon I trust, on our Picasa site at http://picasaweb.google.com/dncbirding. Because of DNCB flak, our Yew Lake planned outing was canned and we decided to go local. First stop was the “pull-off” on the causeway into the Tsawwassen Ferry Port. 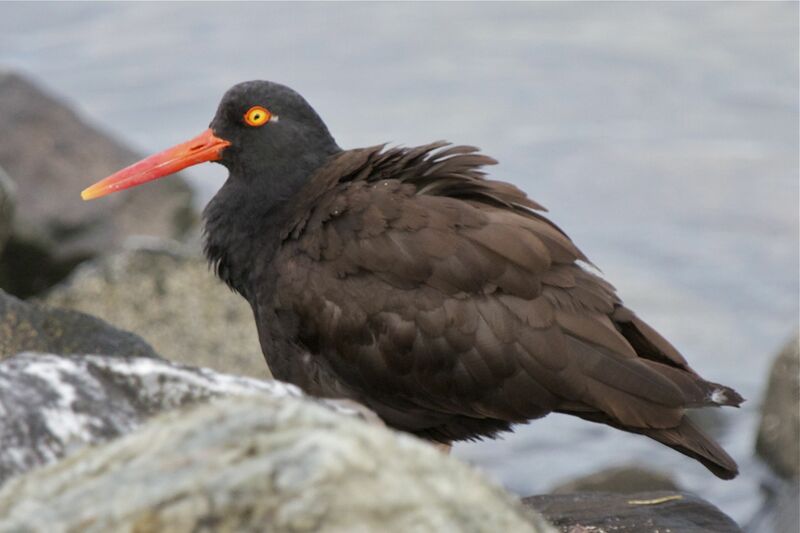 The tide was high and two pair of Black Oystercatchers were on the rocks close by for good photo ops. We did not see any young birds, but hopefully the young we saw there on earlier visits survived. Several noisy Caspian Terns flew by, along with many, many Great Blue Herons. A weird pair of a female Common Goldeneye and juvenile male Bufflehead casually swam by. 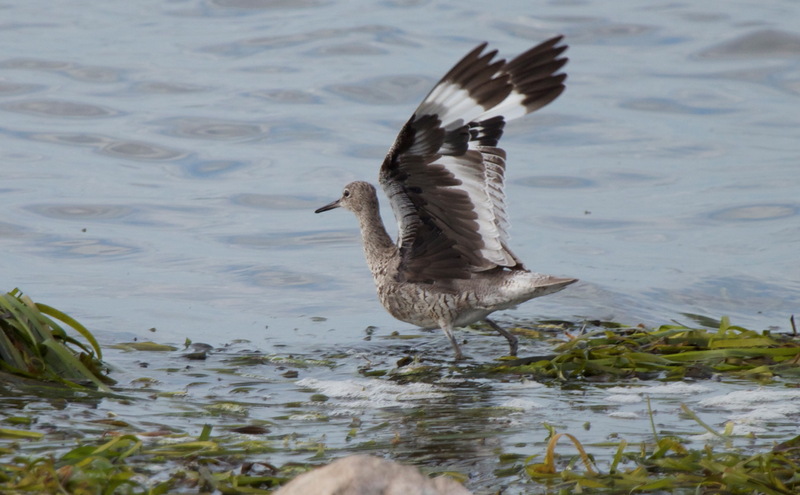 We circled back to the other side of the causeway where the resident Willet was there, for I am told the 12th consecutive year. It’s the only one I know of in this Delta region. We also saw about eight Harlequin Ducks, but not in pretty breeding plumage. We drove through the Tsawwassen First Nations Reserve and the Ladner farmers’ fields to the Westham Island Bridge. Not much interesting seen other than more Red-tailed Hawks than we normally see, a few Eurasian Collared-doves, a Rufous Hummingbird, and David Bradbeer of the Delta Farmland and Wildlife Trust who was cruising the back roads and stopped to give us his spiel on what DFWT is conserving in cahoots with the local farmers (e.g. planting Clover to feed the wintering birds). Along the Reifel entrance road, some saw a Western Kingbird and a Belted Kingfisher while others were grooving on that elusive American Robin. Reifel Manager, Kathleen Fry briefed us on the latest interesting sightings (e.g. Great-horned Owl, Sora and Virginia Rail), of which we saw none. Since the tide was high, we decided to walk quickly to the Lookout Tower to see the Shorebirds. Of course, Roger and Hans-Ulf got lost. Along the west trail we saw lots of Cedar Waxwings, Brown-headed Cowbirds, American Goldfinches, Marsh Wren, Wood Duck and Gadwall families. At the tower, flocks of Dowitchers (both Long-billed and Short-billed, which a select few of us could differentiate) were close by, with lots of Peeps too. Some were able to identify the black-legged Western and Semipalmated Sandpipers and the yellow-legged Least Sandpipers. 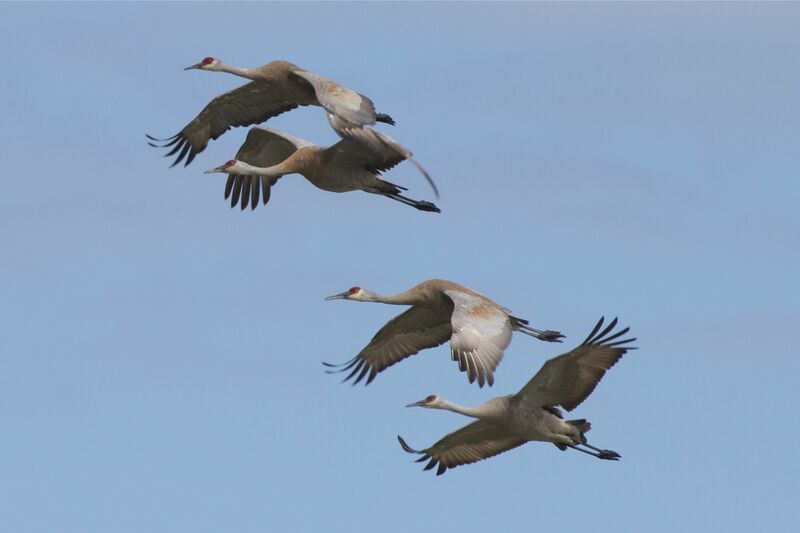 All of us could identify the eight Sandhill Cranes lounging in the outer pond, plus the Reifel family including the now-flying juvenile which flew in and “scared off” the eight interlopers encroaching in their domain. We also saw a Spotted Sandpiper, a few Yellowlegs (Greater and/or Lesser), several Killdeer, and the “Lost Ones” saw a Wilson’s Phalarope and a Sanderling, which they conveniently scared off before the rest of us got to that pond. A group (8-10 birds) of Hooded Mergansers were swimming among the Mallards, Gadwalls and Canada Geese. We left Reifel around Noon, most claiming to have had an enjoyable morning, despite the inane conversation, but the coup de grace was the stop at Emma Lea’s Farm on the way back to Petra’s where we each scoffed down a huge ice cream Sundae, loaded with freshly-picked Blueberries and Strawberries. I will be at Petra’s next Wednesday morning, August 10, for departure at 7:30 a.m. on an outing “somewhere around the Bay” (i.e. local). 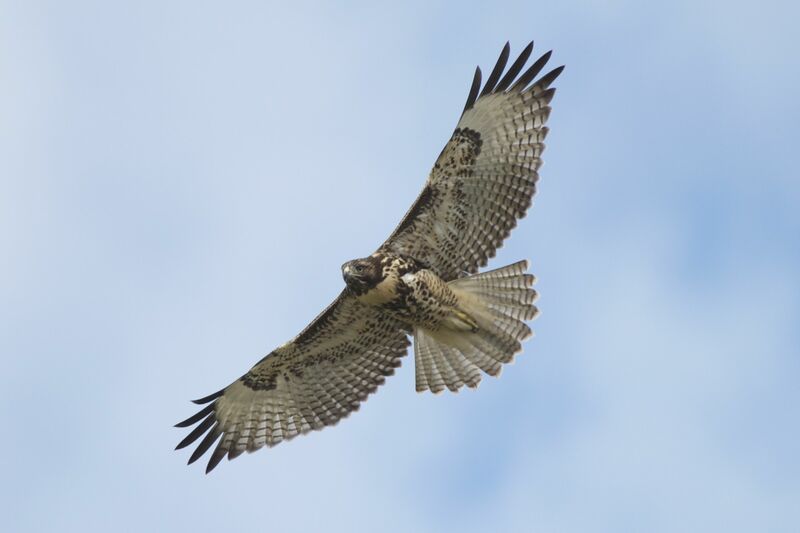 We’re looking for volunteers to “(wo)man” our Delta Nats Display at three upcoming events; Festival of Birds at BBRP and Starry Night at Deas Island Park, both on Saturday, August 13 and the Richmond Raptor Festival at Terra Nova Park on Sunday, August 21. Contact me or Terry Carr if you’re available and interested. Again, comments encouraged, check out our DNCB Blog at https://dncb.wordpress.com/, and let me know if these Reports annoy you. This entry was posted in *DNCB, Reifel, TFN, Tsawwassen Ferry Port, Westham Island. Bookmark the permalink.